Entertaining a dog doesn’t get much easier than blowing bubbles. 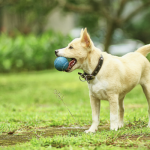 When it comes to keeping your dog busy and active you’re golden if you can teach your dog to chase bubbles. I’m not sure how this came about but Laika had an epiphany this month. It said that chasing bubbles is the absolute best thing in the world. Ever since that day it’s all she wants to do. Rather than nudging me towards the door for a walk, or the toy box for a game of indoor fetch it’s all about bubbles. I hold out a bottle of bubbles in one hand and our favorite tug toy in the other – she goes for the bubbles every time. I’m not sure when her obsession came about, it’s been quite gradual. And it’s a complete mystery to me how this doesn’t affect her arthritis at all. But I’m going with it. My dog loves chasing bubbles, so bubbles she will get. Play is such an important part of our daily routine, and having something simple like chasing bubbles to add into the mix is a blessing. It’s been a long time since I found an activity that Laika can enjoy so much without causing pain later. I remember how depressing it was trying to figure out what we could do with her arthritis. 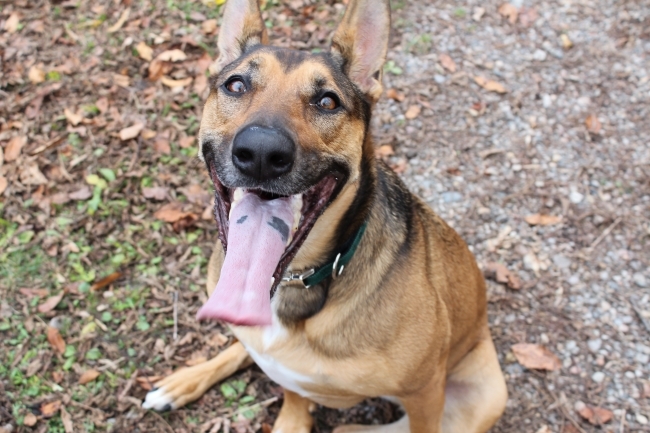 Really long walks make her limp, outdoor games of fetch make her limp, and worst of all her beloved frisbee made her limp – so it had to be retired. 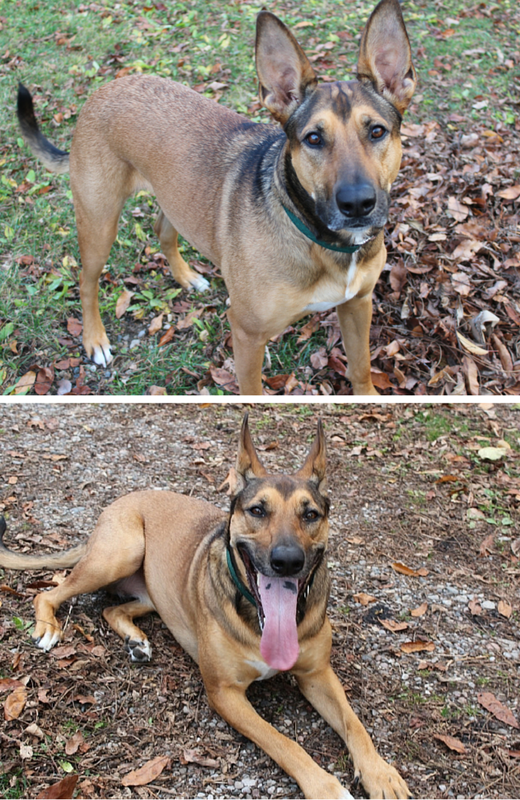 We couldn’t walk by our big basket of frisbees for months without her stopping & whining, it made me feel terrible. My dog loved catching frisbees, so frisbees is what she got. So what do you do when you have to take away your dogs favorite activity? 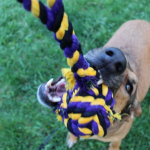 You can’t just tell them “trust me on this – it might be fun now, but you’ll be feeling it later.” Well you could tell your dog that, but I’m pretty sure they’ll keep asking for it anyway. Having a 3 year old dog that can no longer jump or run (much) is depressing, especially since her brain is always ready to go go go. 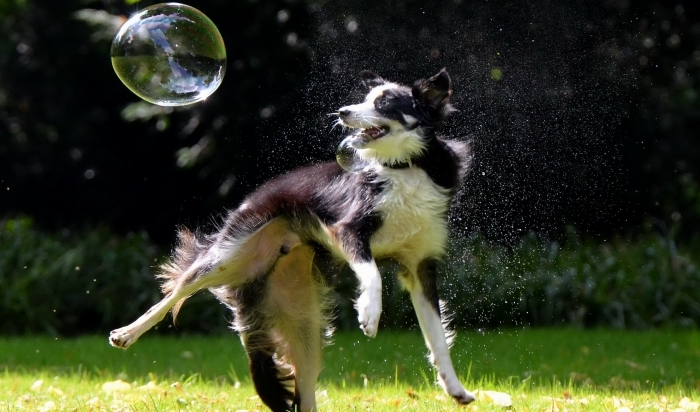 Chasing bubbles is great exercise, and it doesn’t affect Laika’s arthritis. If your dog doesn’t know how to chase bubbles start by blowing a couple at a time. If they’re not interested in them try pointing to them. If that doesn’t work get a friend to play ‘bubble in the middle’ with you. 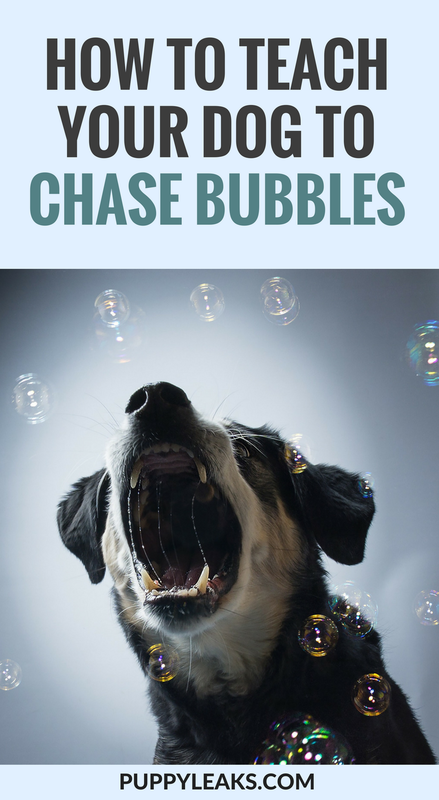 Once your dog sees that the bubbles are meant to be chased they should catch on. So try it for yourself, see if you can teach your dog to love chasing bubbles. It can be done indoors (if you move the coffee table) or out, day or night. 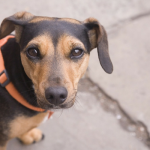 It’s one of the easiest ways to tire out your dog. Once you have a bottle & wand you can make your own supply with some dish detergent & water. Some people add corn syrup to make the bubbles last longer, but I haven’t had any problems with the soap & water mixture. 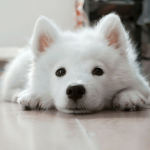 Homemade bubble recipes are safe for your dog, just be careful that they don’t get into the mixture itself. And after playing be sure to wipe off their face with a damp towel. Bubble mixtures can irritate their eyes. So if you’re looking for an easy way to play with your dog get yourself some bubbles. You just might luck out and have a dog that thinks you’re nothing short of a wizard. Not only the funnest person in the whole world, but the creator of all those magical flying bubbles. I understand about the dog wanting to play Frisbee or fetch but being in pain later. Ace and I do this game where I back away from him and then throw his tennis ball right to him for him to catch. I’m sure people in the park look at me like I can’t throw, but I can’t throw it away from him or he will be too sore (or injured) later. We have a bottle of bubbles. I’ll have to bring them out the next time I go outside with the dogs. This is something I tired with Rodrigo and Sydney, but it would be fun to see how Scout and Zoey do with them. One thing we do in the winter is play fetch with snowballs. It’s hilarious, because the dogs will chase them and pick up a mouth full of snow. The girls got bored of this quickly once they realized you can chase it but you can’t really catch it. Plus I think Cookie detested the taste. Plus I kind of feel bad for making her chase something that’s impossible to get. I saw bacon bubbles for dogs once. I wish I had bought them. Haley loves bubbles too but she was so obsessed I was worried about her eating so many of them. We found some food grade bubbles a few years ago and they lasted longer than the soap-based bubbles. I haven’t seen them for sale anywhere lately, so maybe I’ll have to look online for them. I’m so glad you found something fun for Laika that doesn’t bother her arthritis too much. We started with the less is more technique to get Laika interested in bubbles, so we started with just blowing a couple at a time. I noticed when we did a whole bunch at a time she seemed pretty overwhelmed and unable to concentrate because there were hundreds going everywhere. So with just one or two bubbles floating around I’d point to them and ask “what’s this?” (I know, I talk to my dog a lot :)). Eventually after I showed enough interest in them myself she started following around too. I was reading this to make sure it was safe, because I don’t know what made me think of it but I did this with my beautiful Riley and she loves it, pretty sure she would do it for hours. If you haven’t tried it do ??????????????? ?